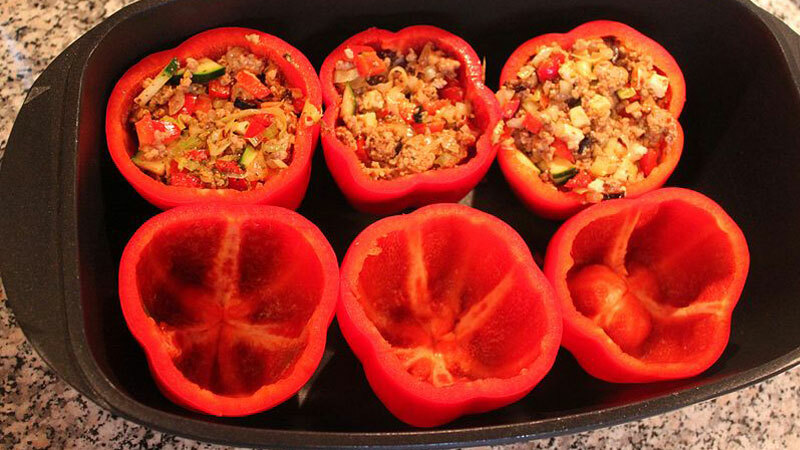 Wrap the bell peppers in aluminum foil, and place in a baking dish. Bake 15 minutes in the preheated oven. Remove from heat. In a skillet over medium heat, cook the turkey until evenly brown. Set aside. Heat oil in the skillet, and cook onion, mushrooms, zucchini, red bell pepper, yellow bell pepper, and spinach until tender. Return turkey to the skillet. Mix in the tomatoes, and season with Italian seasoning, garlic powder, salt, and pepper. Stuff the green peppers with the skillet mixture.